Olympic gold medallist and world record holder Charlotte Dujardin conducted a two-day master class at Caledon Equestrian Park. More than 700 enthusiastic dressage riders and fans filled Caledon Equestrian Park for the first day of a two-day master class with Olympic gold medallist and world record holder Charlotte Dujardin. Dujardin did not disappoint. Spectators enjoyed seeing the British champion’s training system in action as she taught her way up the levels from 4-year-olds to Grand Prix horses. Peppering her lessons with the humourous quips for which she is famous – “Don’t just sit there like a fairy on a Christmas tree!” – Dujardin demonstrated how progression at each level depends on a solid foundation of correct basics and attention to the smallest detail. The session began with two 4-year-old mares, Brigitte ridden by Inga Hamilton, and Juweel of Lichty ridden by Neil McIntosh. Dujardin described what she looks for in a young horse: three correct but not necessarily huge gaits, a willing character, and a hotter, more sensitive nature. She worked with the riders on establishing good rhythm, steady contact and appropriate self-carriage at each of the gaits. Next in the ring was Leah Wilkins on 6-year-old High Energy STH, to demonstrate Second Level. The difference two additional years of maturity and training can make were immediately apparent. With rhythm and straightness well established at each gait, Dujardin says this is the stage at which she introduces lateral work, as well as beginning to play with the single flying change. Justin Ridgewell and Jolene were up next, representing Third Level. Though the 7-year-old mare was intimidated by the large crowd, Dujardin complimented her quality and obvious ability, saying: “This is the sort of horse I look for.” By age seven Dujardin’s horses are working on more advanced lateral work and starting pirouettes, which she introduced by having Justin switch between shoulder-in and haunches-in on a circle, then spiralling the circle in and out. Bobbie Kerr and Iggi Pop were the first FEI-level pair in the ring, showcasing the Prix St-Georges. The pair, who recently competed at the FEI North American Youth Championships, capably demonstrated the more difficult requirements at this level, including half pirouettes, tempi changes and the extended trot. While very complimentary about their performance, Dujardin still pushed Bobbi to ask for more, even if it means risking a mistake, and not to overlook details such as the quality of transitions. The final rider of the day was Tanya Strasser Shostak, representing the under-25 Grand Prix level. In a last minute switch she chose to ride Rigaudon Tyme, more often ridden by her mother Evi Strasser. 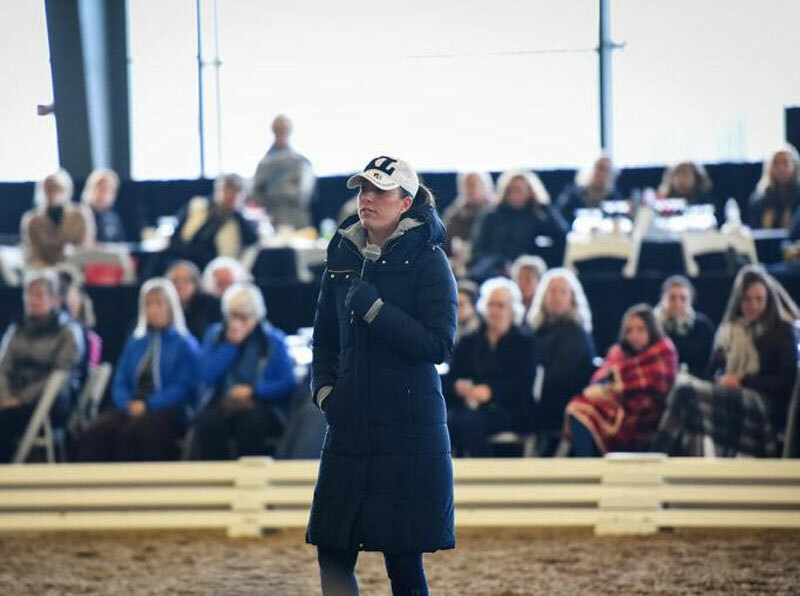 The audience enjoyed learning the intricacies of training at the highest levels of dressage, including Dujardin’s methods for teaching the canter zig zag, flying changes every stride, passage and piaffe. Six more horse and rider combinations will get their chance to work with Dujardin tomorrow when Day 2 of the master class gets underway. A limited number of tickets are still available at caledonequestrianpark.ca.